Advanced solutions in two finishes that target & treat for healthier, stronger nails? Ok.
Greetings to you, my fellow polish nerdies! I’ve got some summer 2016 Formula X stuff to show you today! What is it? It’s “repair, nourish, and shine” in two formulas, Sheer Strength and Full Strength. Shall we look? 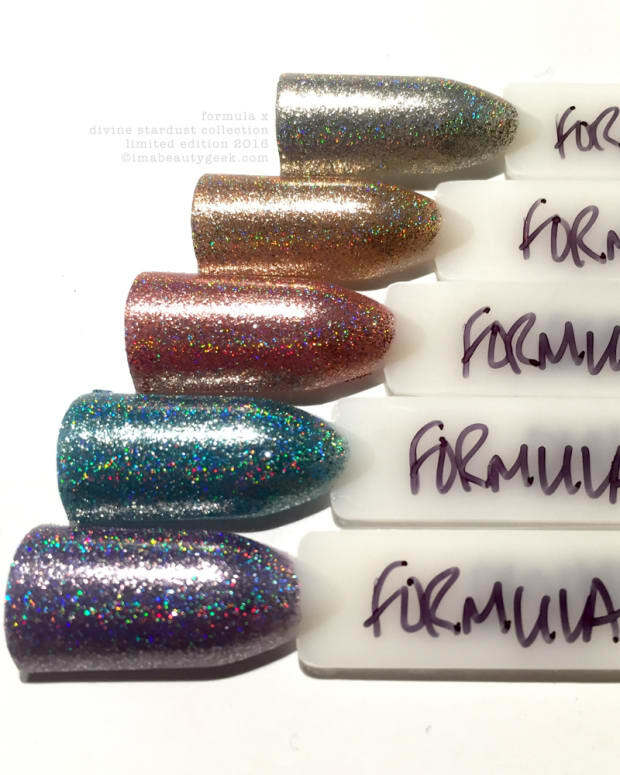 Let’s start here with a couple of the the Formula X Sheer Strength shades. There are five new Sheer Strength shades for summer; two landed on my desk. 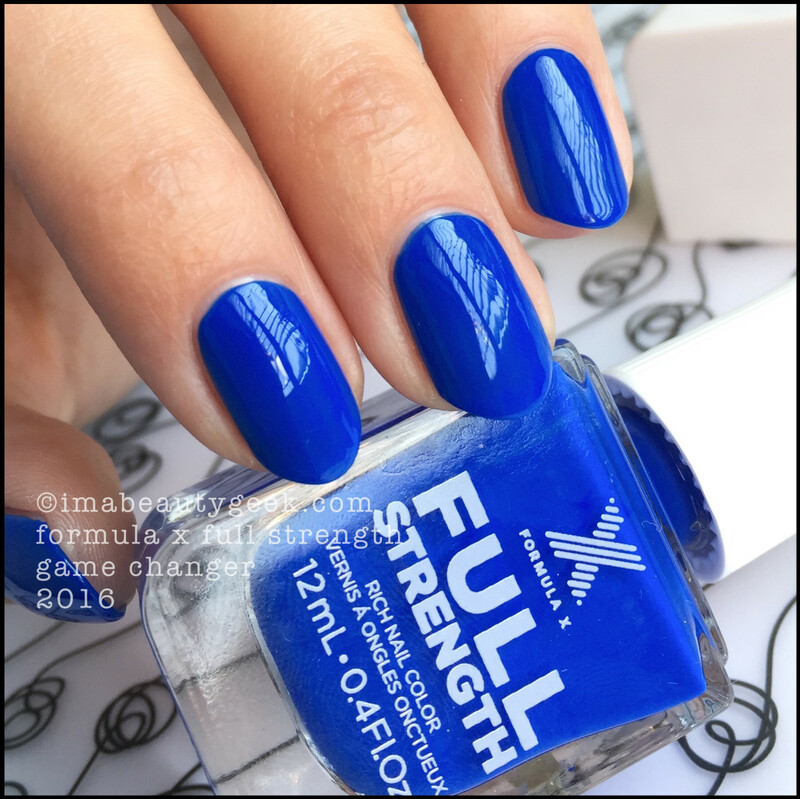 Formula X Sheer Strength Undeniable (above). These shades are supposed to be “like a multi-vitamin for your nails.” They’re apparently “packed with botanical extracts, keratin, and natural hydrators to improve nail health with maintaining a beautiful, barely-there mani.” That’s what my press sheet says! Oh. That’s two coats. They’re quick-to-apply and dry a little faster than I thought they would. 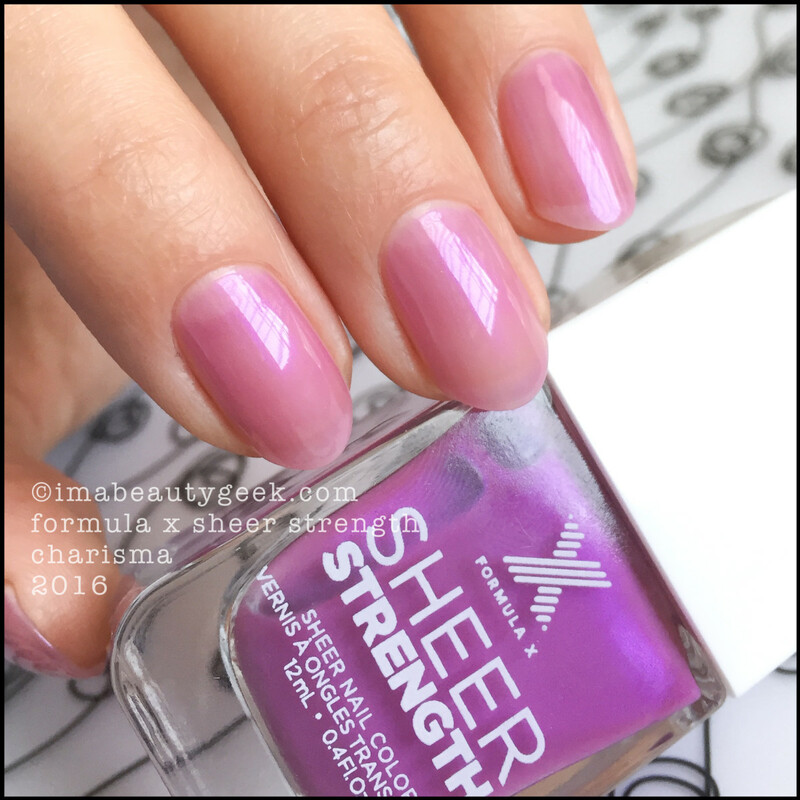 Formula X Sheer Strength Charisma (above). Again, that’s two coats of the sheer and while I’m not generally a sheer fan, I can totally handle this. It’s got a lovely shimmery thing happening that totally turns my polish crank. If it’s going to nourish and treat my nails at the same time I’m wearing it, that’s an über-bonus, right? 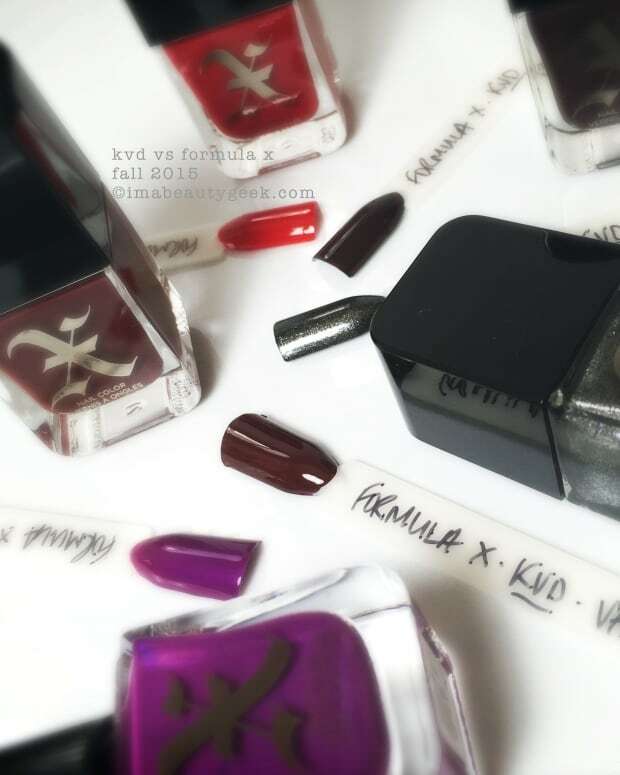 Formula X Full Strength Pink Prowess (above). What’s this Full Strength stuff? Well it’s opaque colour that I guess is like Sheer Strength, ‘cept you can’t see through it. I’ve got two shades to show you. I&apos;m wearing two coats in the above image and let me tell you… it glides on like a dream! If I’d put a little more on my brush, I might have gotten away with it as a OCW! Here, let me show you the brand-spankin’-new brush! Formula X Sheer Strength Brush vs Formula X Full Strength Brush (above). Lookit that one on the right! It&apos;s a new 440-count bristle brush! They’re calling it their Xpert Strokes Brush. You know who else just came out with a 440 brush? L’Oréal. And if you ask me, it’s the same brush (save the 3-double-squared stem L&apos;Oréal has) and it’s wonderful. If you’re a fan of Dior’s brush, YSL’s brush, the Guerlain brush, or the new Essie brush, you’re really going to like this one. It makes polishing so easy – especially if you have lots of real estate to cover. For little nails, just slim the brush profile down using the bottle neck (Essie&apos;s Rita Remark demonstrates that brush-slenderizing move in this video) – easy! Formula X Full Strength Game Changer (above). I’ve never used a blue like this that went on as splendidly as this one did. That is to say not ever. The combination of the new Xpert Strokes Brush and this particular formula was mind-blowingly amazing to use. The stuff pretty much painted itself on in two crazy-easy coats. Stunning. If it’s got a whack of stuff in there that either may or may not actually healthify my nails (I’m no chemist or scientist so I can’t say if it works as advertised or not), the fact that it goes on the way it does and is as shiny as it is, is enough to give me #GrabbyHands for all 10 shades. So where can you get it? In-store at Sephora or online at Sephora.com. When will it be available? Now. You gonna get you some? Manicures and photographs Karen Falcon (She thought today was Thursday. It’s not Thursday).